Celebrating Small Business is something we don’t do enough. Last year, with the help of American Express’s annual campaign, Small Business Saturday, LBL worked to create a special, local version to coincide with the work AMEX had been doing. We’re excited to say, that work paid off because, this year, we’re growing! 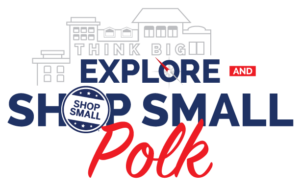 Thanks to the partnership with the Bartow Chamber of Commerce, we are expanding our reach beyond Lakeland and starting to bring the ShopSmall Love to more of Polk County! Local Merchants can get involved by signing up to be a “Stop” on our passport, so that all of our shoppers know you’re participating as we promote the event! And, if you’re interested in even more exposure, or if your business isn’t a brick and mortar, but you’d like to let the community know that you’re a big supporter of our small business community, you can become a sponsor! If you landed on this page by accident, and would like to know more about the opportunities for your business to participate, visit the Merchant page and Sponsor page!